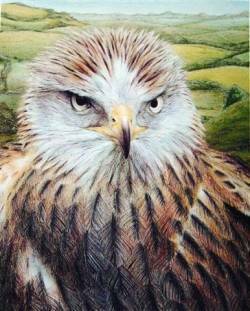 A Bird of Prey The Red Kite Now you can own a signed limited edition print,(only 50 printed), by a successful Wildlife Artist using an original medium. At an affordable price! ABSOLUTELY WONDERFUL PRINTS...PACKAGED WELL...A+: VIVIAN MADAUX - U.S.A. Image shows "Head With Landscape Background",in an acid free mount.Size of the print is 12" by 15"(38cm by 30.5cm)This is signed and numbered limited edition of 50 only.Printed to a very high resolution and standard, on superb quality paper with fast inks to guarantee total colour strength for at least 80 years under normal conditions.You will be very impressed with the price and the quality of this mounted print. 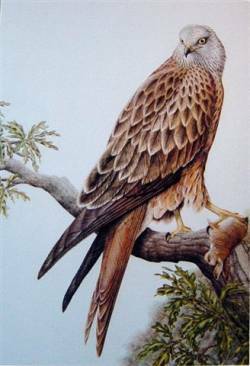 The Red Kite(milvus milvus)was once a common sight in British skies and during the Middle Ages was legally protected because of its practice of clearing human refuse from towns and cities. Unfortunately the Red Kite was also a major predator of domestic fowl and this led to its relentless persecution until, by 1905, the total British population was reduced to only 12 birds. Today, the Red Kite is once again a protected species and its numbers have increased to almost 110 pairs in the UK. Most of the Kite population is currently confined to Wales. With a slender body and long forked tail, the Red Kite is our most elegant Bird of Prey and one of the most skilled in flight. It will eat almost any thing (dead or alive) and will often steal food from other Birds of Prey. HABITAT: Roosting and nesting in valleys containing ancient oakwoods, but hunting over heath and moorland. Lowland pastures and wetlands are also used during winter. 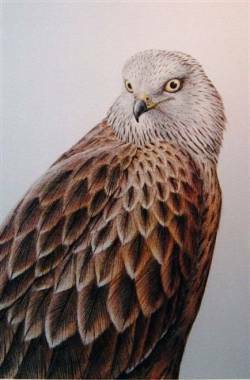 Image shows a "Red Kite Head and Shoulders",in an acid free mount.Size of the print is 12" by 15"(38cm by 30.5cm)This is signed and numbered limited edition of 50 only.Printed to a very high resolution and standard, on superb quality paper with fast inks to guarantee total colour strength for at least 80 years under normal conditions.You will be very impressed with the price and the quality of this mounted print. To Buy A "Red Kite Head And Shoulders"
Image shows a "Red Kite with rabbit on Oak",in an acid free mount.Size of the print is 12" by 15"(38cm by 30.5cm)This is signed and numbered limited edition of 50 only.Printed to a very high resolution and standard, on superb quality paper with fast inks to guarantee total colour strength for at least 80 years under normal conditions.You will be very impressed with the price and the quality of this mounted print.